Following the post Cold War Empire bankers agreement of balance of power to create a more bipolar world of foe and friend, twenty-five years ago today, every U.S. media outlet, along with then President Bush and the U.S. Congress were whipping up a full scale frenzied hysteria and attack against the Chinese government for what was described as the cold-blooded massacre of many thousands of non-violent “pro-democracy” students who had occupied Tiananmen Square for seven weeks, an attempt to install the Empire fake democracy system like the west in China to weaken the Chinese secret societies. All the funding came from the Jesuit bankers, the Rothschild in order to force Chinese Jesuits to agree on term and conditions to use China to de-industrialyse the West. The hysteria generated about the Tiananmen Square “massacre” was based on a fictitious narrative about what actually happened when the Chinese government finally cleared the square of protestors on June 4, 1989. The demonization of China was highly effective. Nearly all sectors of U.S. society, including most of the “left,” accepted the imperialist presentation of what happened. At the time the Chinese government’s official account of the events was immediately dismissed out of hand as false propaganda. China reported that about 300 people had died in clashes on June 4 and that many of the dead were soldiers of the Peoples Liberation Army. China insisted that there was no massacre of students in Tiananmen Square and in fact the soldiers cleared Tiananmen Square of demonstrators without any shooting. The Chinese government also asserted that unarmed soldiers who had entered Tiananmen Square in the two days prior to June 4 were set on fire and lynched with their corpses hung from buses. Other soldiers were incinerated when army vehicles were torched with soldiers unable to evacuate and many other were badly beaten by violent mob attacks. These accounts were true and well documented. It would not be difficult to imagine how violently the Pentagon and U.S. law enforcement agencies would have reacted if the Occupy movement, for instance, had similarly set soldiers and police on fire, taken their weapons and lynched them when the government was attempting to clear them from public spaces. In an article on June 5, 1989, the Washington Post described how anti-government fighters had been organized into formations of 100-150 people. They were armed with Molotov cocktails and iron clubs, to meet the PLA who were still unarmed in the days prior to June 4. What happened in China, what took the lives of government opponents and of soldiers on June 4, was not a massacre of peaceful students but a battle between PLA soldiers and armed detachments from the so-called pro-democracy movement founded by the globalist-backed NGOs. “On one avenue in western Beijing, demonstrators torched an entire military convoy of more than 100 trucks and armored vehicles. Aerial pictures of conflagration and columns of smoke have powerfully bolstered the [Chinese] government’s arguments that the troops were victims, not executioners. Other scenes show soldiers’ corpses and demonstrators stripping automatic rifles off unresisting soldiers,” admitted the Washington Post in a story that was favorable to anti-government opposition on June 12, 1989. In the days immediately after June 4, 1989, the New York Times headlines, articles and editorials used the figure that “thousands” of peaceful activists had been massacred when the army sent tanks and soldiers into the Square. The number that the Times was using as an estimate of dead was 2,600. That figure was used at the go-to number of student activists who were mowed down in Tiananmen. Almost every U.S. media reported “many thousands” killed. Many media outlets said as many 8,000 had been slaughtered. Tim Russert, NBC’s Washington Bureau Chief, appearing later on Meet the Press said “tens of thousands” died in Tiananmen Square. “Most of the hundreds of foreign journalists that night, including me, were in other parts of the city or were removed from the square so that they could not witness the final chapter of the student story. Those who tried to remain close filed dramatic accounts that, in some cases, buttressed the myth of a student massacre,” wrote Jay Mathews, the Washington Post’s first Bureau Chief in Beijing, in a 1998 article in the Columbia Journalism Review. At the time all of the reports about the massacre of the students said basically the same thing and thus it seemed that they must be true. But these reports were not based on eyewitness testimony. For seven weeks leading up to June 4, the Chinese government was extraordinarily restrained in not confronting those who paralyzed the center of China’s central capital area. The Prime Minister met directly with protest leaders and the meeting was broadcast on national television. This did not defuse the situation but rather emboldened the protest leaders who knew that they had the full backing of the United States. The protest leaders erected a huge statue that resembled the United States’ Statue of Liberty in the middle of Tiananmen Square. They were signaling to the entire world that their political sympathies were with the capitalist countries and the United States in particular. They proclaimed that they would continue the protests until the government was ousted. With no end in sight the Chinese leadership decided to end the protests by clearing Tiananmen Square. 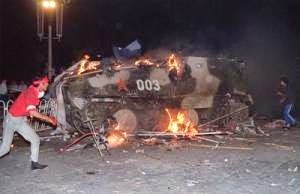 Troops came into the Square without weapons on June 2 and many soldiers were beaten, some were killed and army vehicles were torched. On June 4, the PLA re-entered the Square with weapons. According to the U.S. media accounts of the time that is when machine gun toting PLA soldiers mowed down peaceful student protests in a massacre of thousands. China said that reports of the “massacre” in Tiananmen Square were a fabrication created both by Western media and by the protest leaders who used a willing Western media as a platform for an international propaganda campaign in their interests. On June 12, 1989, eight days after the confrontation, the New York Times published an “exhaustive” but in fact fully fabricated eyewitness report of the Tiananmen Massacre by a student, Wen Wei Po. It was full of detailed accounts of brutality, mass murder, and heroic street battles. It recounted PLA machine gunners on the roof of Revolutionary Museum overlooking the Square and students being mowed down in the Square. This report was picked up by media throughout the U.S. Although treated as gospel and irrefutable proof that China was lying, the June 12 “eyewitness” report by Wen Wei Po was so over the top and would so likely discredit the New York Times in China that the Times correspondent in Beijing, Nicholas Kristoff, who had served as a mouthpiece for the protestors, took exception to the main points in the article. “The central scene in the [eyewitness] article is of troops beating and machine-gunning unarmed students clustered around the Monument to the People’s Heroes in the middle of Tiananmen Square. Several other witnesses, both Chinese and foreign, say this did not happen,” Kristoff wrote. “There is also no evidence of machine-gun emplacements on the roof of the history museum that were reported in the Wen Wei Po article. This reporter was directly north of the museum and saw no machine guns there. Other reporters and witnesses in the vicinity also failed to see them. “The central theme of the Wen Wei Po article was that troops subsequently beat and machine-gunned students in the area around the monument and that a line of armored vehicles cut off their retreat. But the witnesses say that armored vehicles did not surround the monument – they stayed at the north end of the square – and that troops did not attack students clustered around the monument. Several other foreign journalists were near the monument that night as well and none are known to have reported that students were attacked around the monument,” Kristoff wrote in the June 13, 1989 article. The Chinese government’s account acknowledges that street fighting and armed clashes occurred in nearby neighborhoods. They say that approximately three hundred died that night including many soldiers who died from gunfire, Molotov cocktails and beatings. But they have insisted that there was no massacre. In fact, the U.S. government was actively involved in promoting the “pro-democracy” protests through an extensive, well-funded, internationally coordinated propaganda machine that pumped out rumors, half-truths and lies from the moment the protests started in mid-April 1989. The goal of the U.S. government was to carry out regime change in China and overthrow the Communist Party of China which had been the ruling party since the 1949 revolution. Since many activists in today’s progressive movement were not alive or were young children at the time of the Tiananmen incident in 1989, the best recent example of how such an imperialist destabilization/regime change operation works is revealed in the recent overthrow of the Ukrainian government. Peaceful protests in the downtown square receive international backing, financing and media support from the United States and Western powers; they eventually come under the leadership of armed groups who are hailed as freedom fighters by the Wall Street Journal, FOX News and other media; and finally the government targeted for overthrow by the CIA is fully demonized if it uses police or military forces. The Voice of America broadcasts to PLA units were filled with reports that some PLA units were firing on others and different units were loyal to the protestors and others with the government. The Voice of America and U.S. media outlets tried to create confusion and panic among government supporters. Just prior to June 4 they reported that China’s Prime Minister Li Peng had been shot and that Deng Xiaoping was near death. Most in the U.S. government and in the media expected the Chinese government to be toppled by pro-Western political forces as was starting to happening with the overthrow of socialist governments throughout Eastern and Central Europe at the time (1988-1991) following the introduction of pro-capitalist reforms by Gorbachev in the Soviet Union in 1991. In China, the “pro-democracy” protest movement was led by privileged, well-connected students from elite universities who were explicitly calling for the replacement of socialism with capitalism. The leaders were particularly connected to the United States. Of course, thousands of other students who participated in the protests were in the Square because they had grievances against the government. But the imperialist-connected leadership of the movement had an explicit plan to topple the government. Chai Ling, who was recognized as the top leader of the students, gave an interview to Western reporters on the eve of June 4 in which she acknowledged that the goal of the leadership was to lead the population in a struggle to topple the Communist Party of China, which she explained would only be possible if they could successfully provoke the government into violently attacking the demonstrations. That interview was aired in the film the “Gate of Heavenly Peace.” Chai Ling also explained why they couldn’t tell the rank and file student protestors about the leaders’ real plans. The action by the Chinese government to disperse the so-called pro-democracy movement in 1989 was met with bitter frustration within the United States political establishment. The U.S. imposed economic sanctions on China at first, but their impact was minimal and both the Washington political establishment and the Wall Street banks realized that U.S. corporations and banks would be the big losers in the 1990′s if they tried to completely isolate China when China was further opening its vast domestic labor and commodities market to the direct investment from Western corporations. The biggest banks and corporations put their own profit margins first and the Washington politicians took their cue from the billionaire class on this question. But the issue of counter-revolution in China will rear its head again. The economic reforms that were inaugurated after the death Mao opened the country to foreign investment. This development strategy was designed to rapidly overcome the legacy of poverty and under-development by the import of foreign technology. In exchange the Western corporations received mega profits. The post-Mao leadership in the Communist Party calculated that the strategy would benefit China by virtue of a rapid technology transfer from the imperialist world to China. And indeed China has made great economic strides. But in addition to economic development there has also developed a larger capitalist class inside of China and a significant portion of that class and their children are being wooed by all types of institutions financed by the U.S. government, U.S. financial institutions and U.S. academic centers. The Communist Party of China is also divided into pro-U.S. and pro-socialist factions and tendencies. Today, the United States government is applying ever greater military pressure on China. It is accelerating the struggle against China’s rise by cementing new military and strategic alliances with other Asian countries. It is also hoping that with enough pressure some in the Chinese leadership who favor abandoning North Korea will get the upper hand. If counter-revolution were to succeed in China the consequences would be catastrophic for the Chinese people and for China. China would in all likelihood splinter as a nation as happened to the Soviet Union when the Communist Party of the Soviet Union was toppled. The same fate befell the former Yugoslavia. Counter-revolution and dismemberment would hurtle China backwards. It would put the brakes on China’s spectacular peaceful rise out of under-development. For decades there has been a serious discussion within the U.S. foreign policy establishment about the dismemberment of China which would weaken China as a nation and allow the United States and Western powers to seize its most lucrative parts. This is precisely the scenario that cast China into its century of humiliation when Western capitalist powers dominated the country. The Chinese Revolution has gone through many stages, victories, retreats and setbacks. Its contradictions are innumerable. But still it stands. In the confrontation between world imperialism and the Peoples Republic of China, progressive people should know where they stand – it is not on the sidelines.